Text: London was dangerous. We had a girl to help my mother for a few weeks and her mind, like the mind of the one at Ealing, was brimming with crime. She took me to the Camberwell Bioscope to see a film of murder and explosions called The Anarchist’s Son, in which men with rifles in their hands crawled up a hill and shot at each other. When the shed in which one of them was living, blew up, the film turned silent, soft blood red and the lady pianist in front of the screen struck up a dramatic chord. In the Bioscope men walked about squirting the audience with a delicious scent like hair lotion that prickled our heads. Comment: Victor Sawdon Pritchett (1900-1997) was a British author and critic. This extract comes from his first volume of autobiography. the Pritchett family lived in a street off Coldharbour Lane, Camberwell. The cinema he refers to is possibly Burgoyne’s American Bioscope. I have not traced any film from this period with the title The Anarchist’s Son. 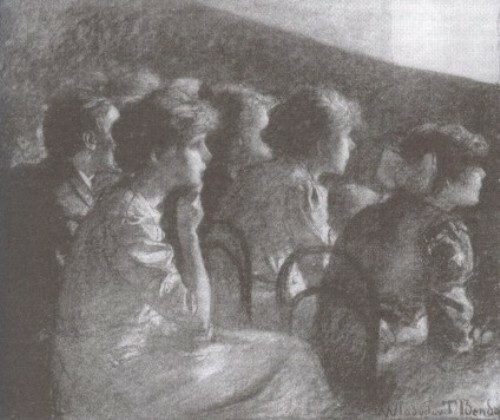 Spraying the audience with disinfectant was common in cinemas in the pre-WWI period. The event recalled dates from the late 1900s. This entry was posted in 1900s, Memoirs, United Kingdom and tagged Audiences, Cinemas, Hygiene, London, Music, Musicians, V.S. Pritchett. Bookmark the permalink.